snippets: Christmas is on its way! Suddenly the store is filling with decorations and the talk in all the scrapbooking forums is of Christmas kits and gift ideas and, of course, Days of December. So I thought I'd mention a few bargain digital scrapbooking goodies that you can pick up. 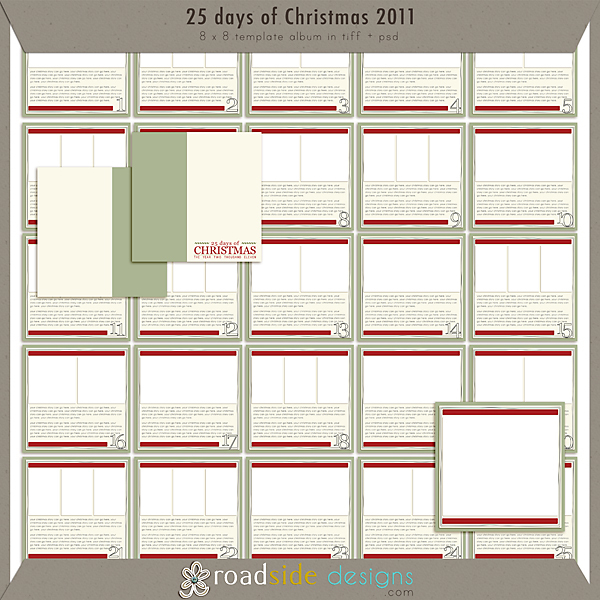 Suzanne of Roadside Designs is giving away a free "25 days of Christmas" set of templates on her blog. Like all of Suzanne's templates they are so well designed and beautifully shadowed. I am such a fan of her templates - pages come together so easily. It seems so funny when I look back at my early days of scrapping and thought that using templates was cheating! Now I use them all the time - scrapping is all about the memory keeping, after all!! Here are a couple of pages I threw together. Credits: Wondrous Full Kit by Creashens at Catscrap, green paper from Flashback by One Little Bird at Oscraps. At Designer Digitals there are some absolutely beautiful Christmas kits being released and there are more bargain digital scrapbooking goodies start today with the Days of December promotion which includes a new 99c product each day. So this all leaves one in a quandary. Should a girl get the Christmas shopping done, tidy the house ready for guests in a few weeks' time, go hunting for all these beautiful bargains or scrap the days of December?!! It is such a busy, exciting time of the year! Thanks for the link to the templates and other products, it is easy to get caught up with and used to the same designers - I have enjoyed seeing these!